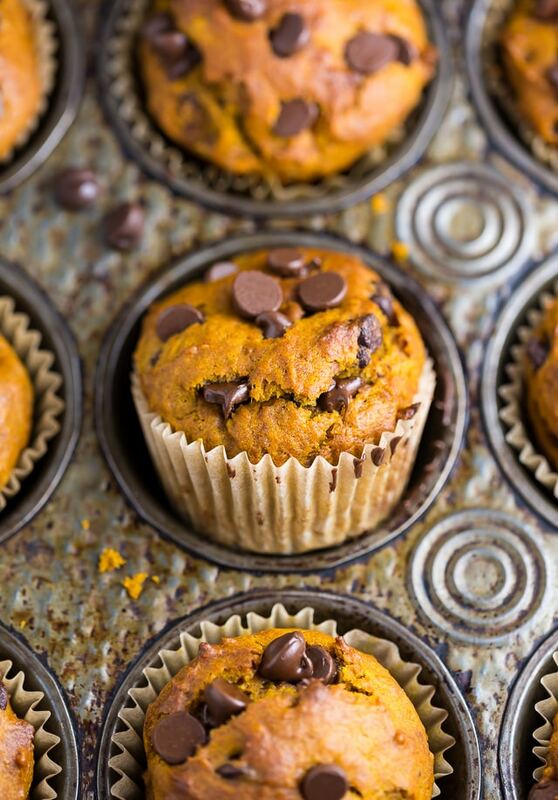 This recipe for Pumpkin Chocolate Chip Muffins and bread is sponsored by Stevia In The Raw®. It’s officially Fall and you know what that means, right? It’s time to bust out the pumpkin and get baking! 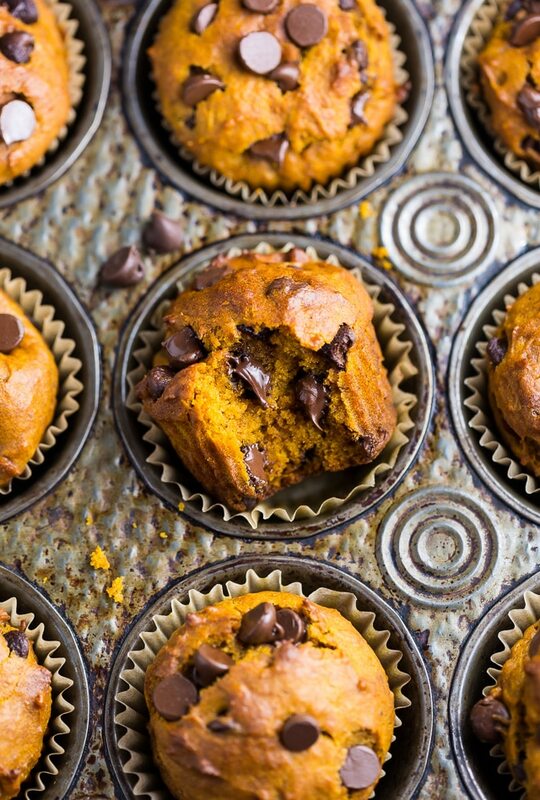 And I have just the recipe to get you started: Pumpkin Chocolate Chip Muffins and Bread! ↑ And yes, you read that right! 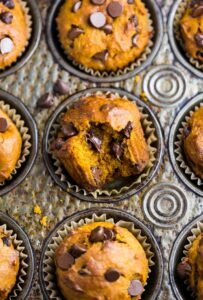 Because I know you love options as much as I do, I created this recipe to yield pumpkin chocolate chip muffins AND pumpkin chocolate chip bread. But that’s not all, my friend. Since many of us love baking, but also love saving calories, I replaced half of the sugar in this recipe with Stevia In The Raw® Bakers Bag. Stevia In The Raw® is a zero calorie sweetener made from the sweet leaves of the stevia plant. Baking with the Stevia In The Raw® Bakers Bag couldn’t be easier as this product measures cup for cup with sugar, so no conversion is necessary. And as a result, I was able to shave a whopping 580.5 calories off of the recipe! And most noteworthy, this change did not affect the taste or texture. Less calories, same great taste! What’s not to love? First of all, if you’re new to baking with Stevia In The Raw®, don’t fret! I know it can be intimidating to use a new ingredient in your kitchen, but I’m sharing all of my tips below! And once you try it, I’m almost certain you’ll be as hooked as I am. And if you have any questions, just ask me in the comment section. I’m always here to help! Light brown sugar may be used in place of the dark brown sugar, but this will alter the flavor slightly. And while it probably seems like a tempting idea to just replace all of the sugar and just use Stevia In The Raw®, I must advise against it! Regular Sugar is still needed in any baking recipe to ensure proper browning, rising and caramelizing. 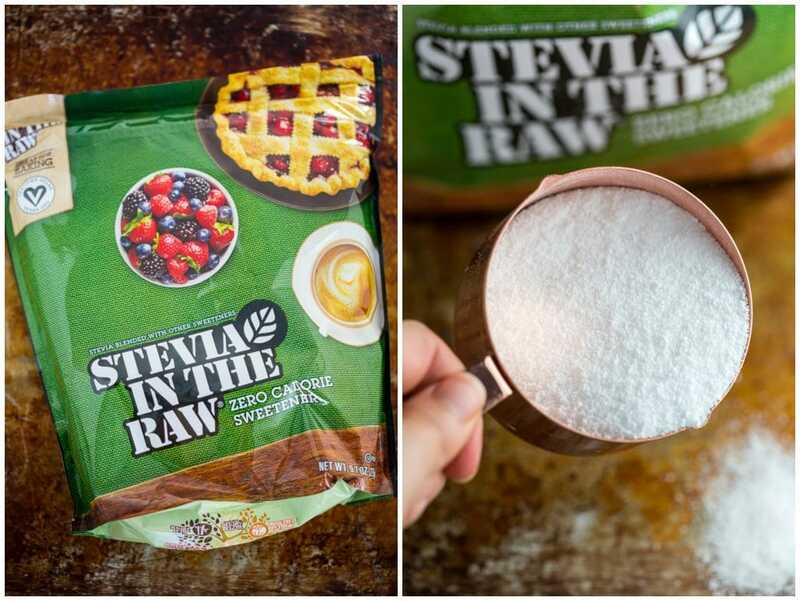 My tip is to replace about half of the sugar in this or any other baking recipe with Stevia In The Raw® Bakers Bag. 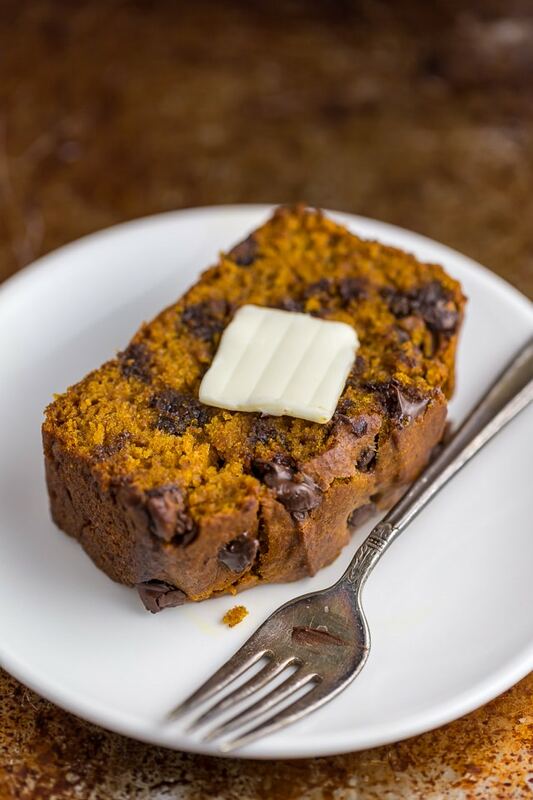 This recipe is insanely moist and flavorful thanks to an entire can of pumpkin, fresh squeezed orange juice, and molasses. You can use bottled OJ if that’s all you have on hand. But be sure to use light molasses, and not the blackstrap variety. Finally, be sure you use pure pumpkin puree and not pumpkin pie mix, which has added ingredients we don’t want for this recipe. If you love baking – and saving calories – I urge you to try out Stevia In The Raw®! And keep an eye out, because I’ll be sharing another festive recipe using this sweetener very soon. If you try this recipe for Chocolate Chip Pumpkin Muffins and Bread, leave a comment below and don’t forget to snap a pic and tag it #bakerbynature on instagram! 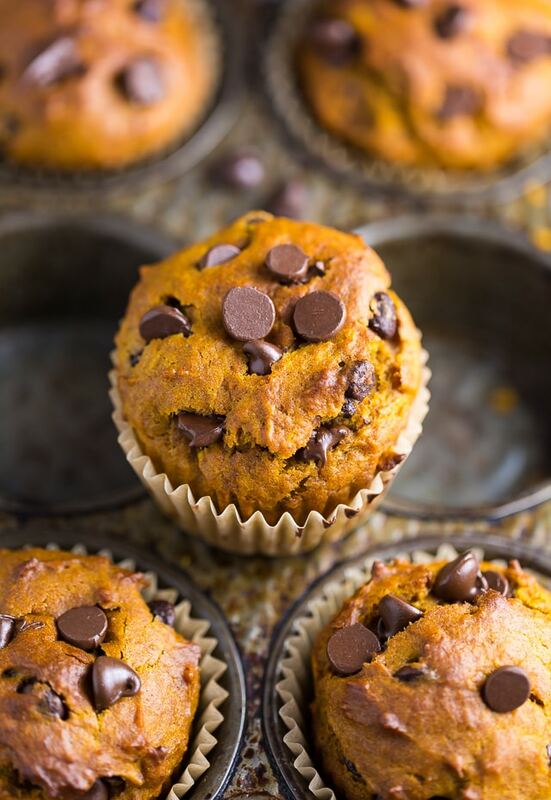 An easy recipe for Pumpkin Chocolate Chip Muffins and Bread! Preheat oven to 400° (F). Line a 12 cup muffin tin with paper liners and set aside. Spray an 8x4 inch loaf pan with non-stick baking spray and set aside. In a large bowl combine the flour, spices, baking soda, baking powder, and salt; set aside until needed. In a separate large bowl combine the Stevia In The Raw® Bakers Bag, brown sugar, and oil; whisk well to combine. Beat in the eggs, one at a time, beating well after each addition. Add in the vanilla, pumpkin, molasses, and orange juice and beat until combined. Using a rubber spatula, fold in the flour mixture, stirring just until combined. Fold in chocolate chips. Fill the muffin cups up first, filling each mold 3/4 of the way full. Scrape remaining batter into prepared loaf pan. Bake the muffins first, for 18 to 22 minutes, or until the tops are golden and a cake tester inserted in the center comes out clean. Allow muffins to cool in the pan for at least 10 minutes before transferring to a serving platter. Place the pumpkin loaf in the oven and bake for 20 minutes, then reduce the heat to 350° (F) and continue baking for another 35 to 40 minutes, or until the top is shiny and a cake tester inserted in the center comes out clean. Cool pumpkin loaf in the pan completely before transferring it to a cutting board and slicing. How much white sugar if not using Stevia? Hi Kim. I created this recipe for Stevia in the raw, so I didn’t test it with sugar. That said, I think an equal amount (1 cup) would work 🙂 I hope that helps! LOVE THIS! 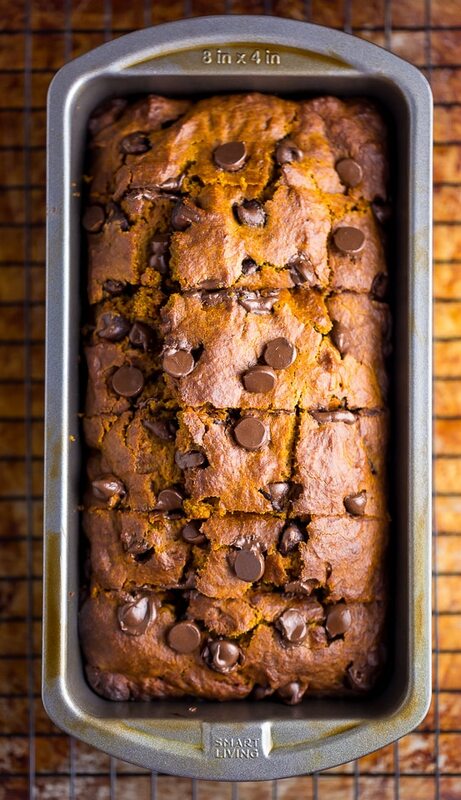 What are your thought on substituting real pumpkin for canned when baking (in this recipe and in general)? Hi, I’m my personal experience substituting real pumpkin/veggies for canned has always worked well! I just made this recipe with 1C acorn squash and 1C sweet potato and it’s delicious but I’d say the spices stand out the most. The colors look stunning! This was on my list of things to bake in November, but I never got to it. Maybe next week.